We awoke to sunshine and a clear view of the mountain tops. Robert selected a ride the 19km ascent of Port De Bales and by 10:20 we were in the car for the "40 minute" drive to the start. As we wound our way up the Col De Peyresourde on our way to Baguettes De Luchon it soon became clear that the estimated journey time was very optimistic and we would not have time to do the ride a make it back in time to visit the spa in Genos. 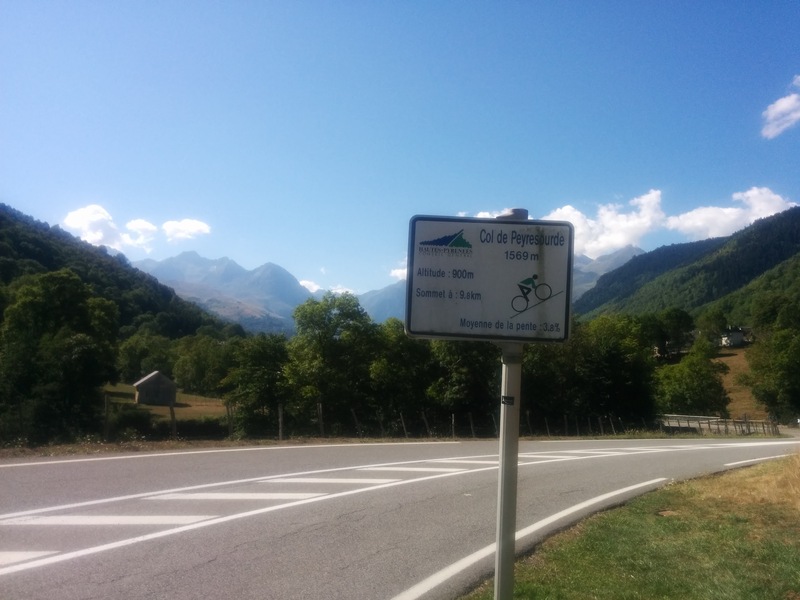 After s little deliberation we turned round and decided to climb the Col De Peyresourde for a second time , this time by bike. 669m of ascent is completely in 9.8km of climbing and even with a slow ascent would allow plenty of time to visit the spa. The km posts helpfully countdown the distance to the top and give the average gradient for the next Km. After a gentle start the gradient increased to 9% . Most of the climb was at 8℅ with the last couple of km averaging 6℅. 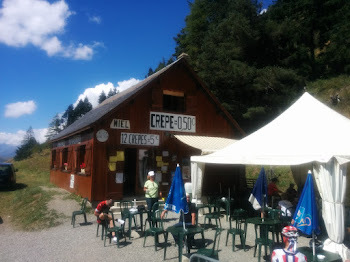 The cafe at the tops offers fresh crapes for 50 cents or 12 for 5 euros and was doing good business from the constant stream of cyclists and other tourists.The menu was limited but we shred and omelette and plate of chips before having a couple of crepes each. The descent back to the car was completed in under 30 minutes including stops for photographs. A one point a few bird of prey circled low above us. They eventually decided better picking could be had elsewhere and moved accross the valley. The spa "balnea " was excellent. The 15.50 euro admission gave 2 hours in the spa with additional time charged at 4 euro for half an hour. We spent two and a half hours in the spa, lots of different areas. The outside Japanese hot pools were particularly good. You moved though a series of pools that steadily incresed in temperature to 40 degrees centigrade while looks at the surrounding mountains and watching the paradescenders slowly descend . 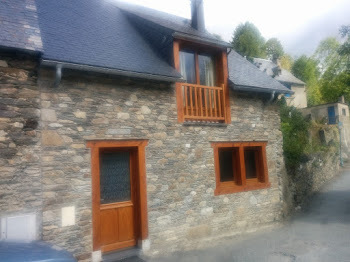 We returned to the gite for a leftover tea. 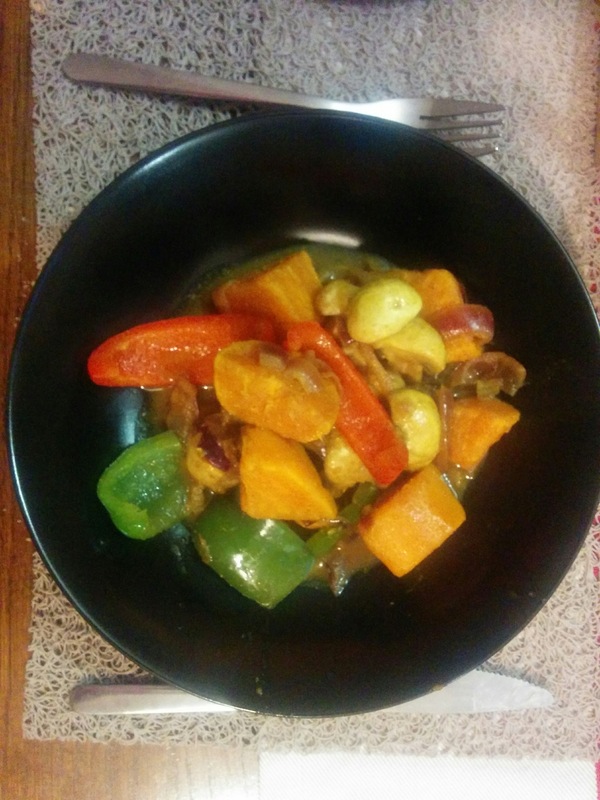 The sweet potato and peppers we had brought from England providing the base for a vegetable curry .